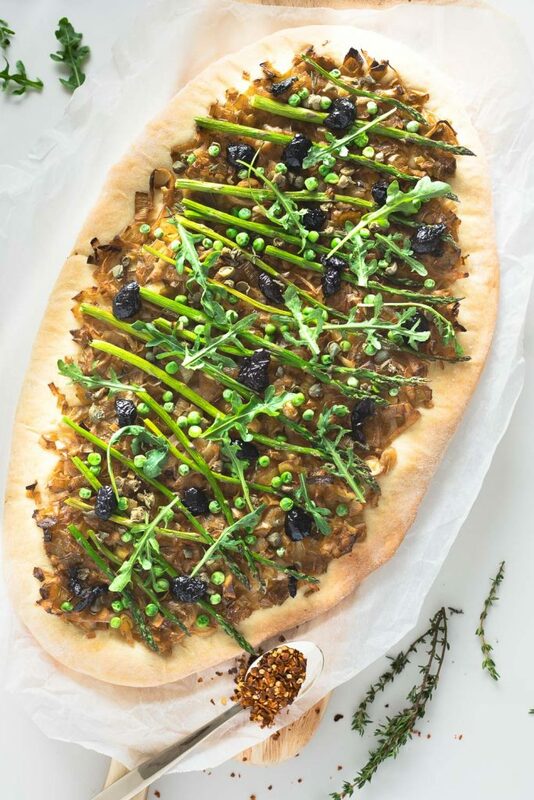 Originating in the south of France, pissaladière is a cross between a savoury pizza and a rich onion tart. 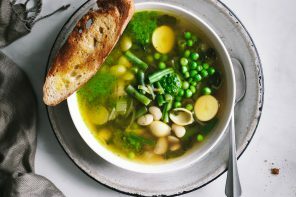 As the weather starts to warm, this spring-inspired version with its vibrant colours and bright flavour profile provides welcome reprieve from the winter-centric menus we’ve been indulging in throughout these cold months. 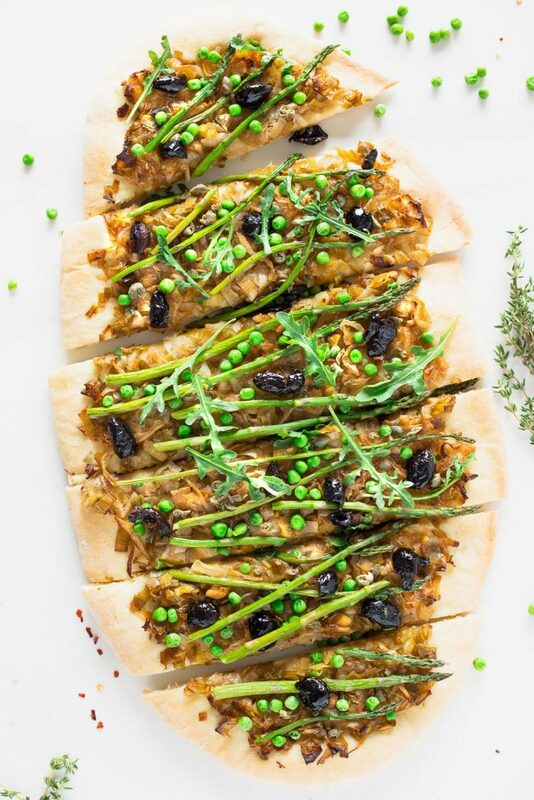 Traditional pissaladière begins with a thinly-rolled puff pastry or pizza-like dough that forgoes a base sauce in favour of a generously thick bed of velvety-sweet caramelized onions. In a throwback to 1970s food styling, anchovies and niçoise olives are then ‘decoratively’ deposited in a harlequin pattern across the top. Google “pissaladière recipe” and you’ll see what I mean. To state the obvious, it’s a look I find rather dated and unappealing. So today, we’re doing our own thing! 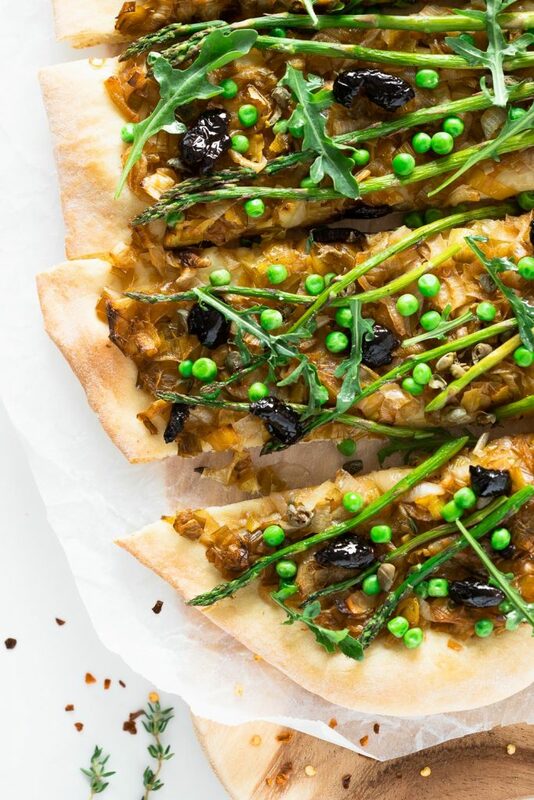 Much to the chagrin of many of my old-school, classically trained culinary school chefs/professors, we are throwing tradition to the wind and celebrating a new, modern, spring-inspired (vegan, at that) pissaladière. Vegan is not a word you often hear in French cooking, but you can trust that those craving an umami-rich experience will get that with this dish. This pissaladière is every bit as satisfying–and I’d even say more so–using briny olives and salty capers in place of anchovies. But if you’re keen to use the anchovies, please do. (I include an option in the recipe below.) 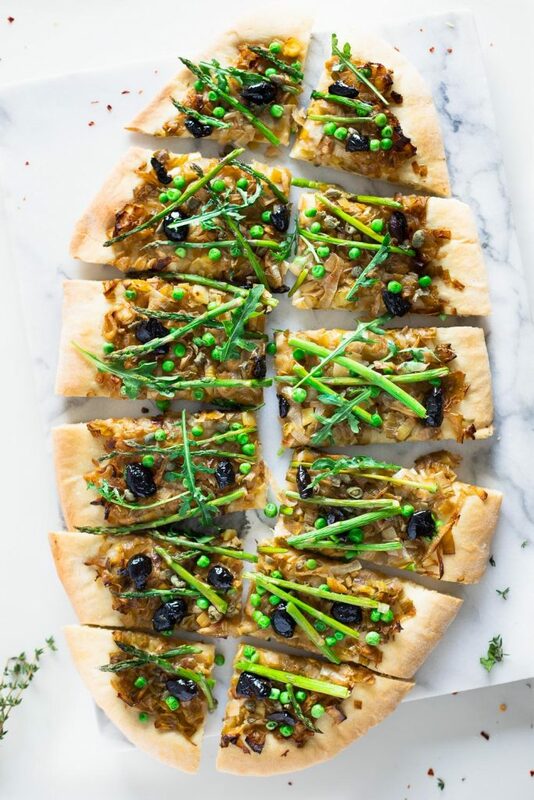 To balance out the richness of the sweet, silky onions, zesty capers, and pungent olives, the pissaladière is freshened up with thin spears of asparagus, sprinkled with bright, sweet peas, and scattered with a few leaves of (optional) peppery arugula. 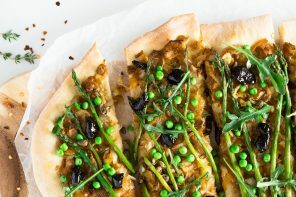 Though not traditional, this spring-inspired pissaladière draws on its French roots and builds using fresh, seasonal, and often local ingredients. It’s the best of both worlds. In place of onions, and as a hat tip to spring, this recipe calls for leeks; and patience is key when it comes to getting the robust caramelization that make an archetypical pissaladière. Caramelization nirvana, as I like to refer to it, is much easier to achieve when practicing patience and, practically speaking, using a wide, thick-bottomed sauté pan. This allows for maximum pan-leek contact where the leeks can truly develop their sugars instead of steaming on top of each other. The caramelized leeks can be made several days in advance and stored in an airtight container in the fridge. 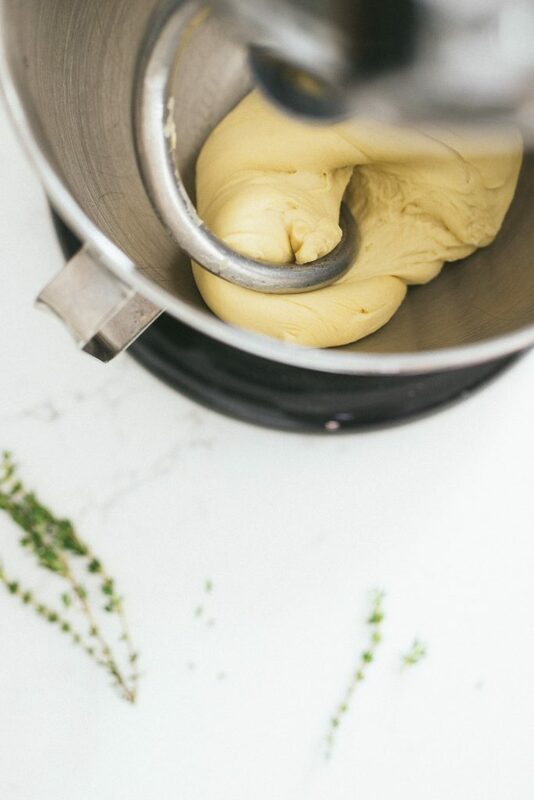 If you don’t have a stand mixer, this dough can be made by hand. See the recipe below. Store-bought dough also works in a pinch. It just won’t be as thin as this homemade version. Options for peas: You can use frozen or fresh, cooked peas. For frozen: add them when they’re still frozen for the final 5 minutes of cooking. They will cook through and shrivel up a little, but will still be delicious. For fresh, cooked peas: sprinkle them on fresh once the pissaladière is out of the oven. A pizza peel, though not necessary, make transferring the dough a lot easier. Anchovies aren’t included in the recipe, but if you’d like a more traditional pissaladière, dot them on on top of the caramelized onions and bake for the required amount of time. You may need to cut back on the capers to balance out the saltiness. For optional (and completely untraditional) heat, serve with chili flakes for sprinkling. 16-20 small asparagus spears (~84 g), washed and trimmed. Larger spears can be cut in half vertically. In a wide, thick-bottomed sauté pan over medium heat, warm 1.5 tablespoons olive oil. When the oil is shimmering, add in the leeks, onions, and a pinch of salt. Stir to coat with the oil, then spread out evenly over the pan and allow it to cook, stirring just occasionally. Continue this process of letting it sit and then stirring it up for 30 to 40 minutes, or until the mixture is a rich, brown colour. Add the balsamic vinegar and stir to combine. Cook for 5 more minutes. Arrange a rack in the middle of the oven and place a rimmed 11″ x 17″ baking sheet on the rack. Preheat oven to 425°F. 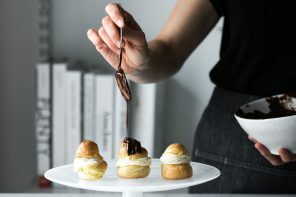 Pour water into the bowl of a stand mixer (of if you don’t have a stand mixer, a medium bowl will do) and with the flat paddle (or a fork) stir in the yeast and honey just to combine. Set aside until dissolved and foamy, about 3 to 5 minutes, then stir in the olive oil. Add the flour and salt, and with the same flat paddle, mix on low speed just until it comes together. If you don’t have a stand mixer, mix with a fork or dough whisk until a shaggy dough forms. Switch to the dough hook and mix on medium low for 5 minutes. Alternatively, urn the dough out onto a work surface and knead until it a smooth, slightly tacky dough forms, about 5 to 8 minutes. It should spring back when poked. Increase the speed to medium, and mix until the dough is smooth and elastic, about 2-3 minutes. Cover the dough with a clean kitchen towel and let sit for 10 minutes. Transfer dough onto a lightly floured surface and, using a rolling pin, roll dough into a thin, 10- to 12-inch oval or rectangle. You may need to flip the dough from time-to-time or add more flour as you’re rolling it out to prevent from sticking. If the dough starts to shrink back, let it rest for a few minutes before rolling again. Transfer dough onto a piece of parchment paper and top with a thick layer of caramelized leeks and onions. Remove the pan from the oven and quickly transfer the dough (and parchment) to the pan. Bake for 10 minutes. 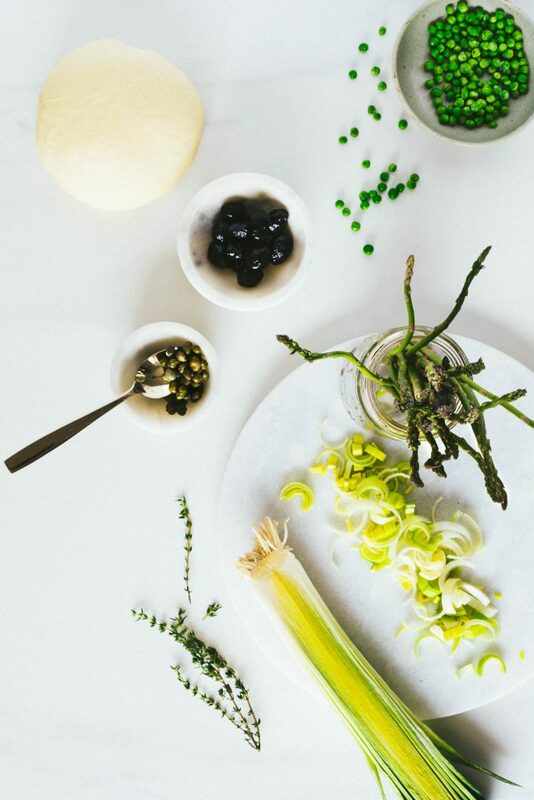 While the pizza is cooking, drizzle 1/2 teaspoon of olive oil onto the asparagus and season with salt and pepper. Toss to combine. Remove the pissaladière from the oven and layer the asparagus across the top in so there’s space in between each spear. Bake for 5 more minutes and remove from the oven. Sprinkle on the capers and frozen peas, if using (see notes above) and bake for 5 minutes. Remove from oven. Allow it to rest for 5 minutes. Optionally garnish with a few fresh thyme leaves and a scattering of fresh arugula. Cut and serve immediately. Store any leftovers in an airtight container in the fridge for a couple of days. 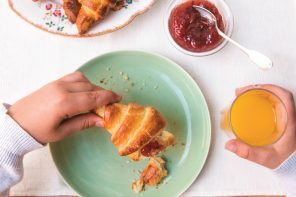 Previous articleHomemade croissants? Yes you can! 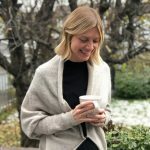 Oh Canada! 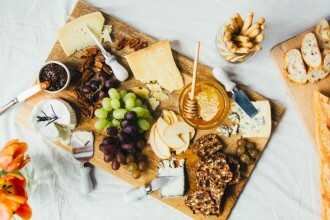 Your cheese is delicious.